One lonely evening when I had all the time to myself and not the drive to do anything else, I decided to be the couch princess. I turned on the TV and came upon this relatively recent Filipino movie on Cinema One. It could be that it has just started when I saw it, but the first few scenes I saw glued me to the screen until the movie finished. 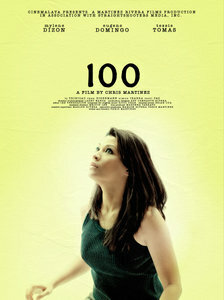 The title of the movie is “100”, starring Mylene Dizon. It was about a single woman in her mid-30s who has found out that she has advanced cancer and had roughly 3 months left to live. Knowing this and accepting it, she started to write on post-its everything she wanted to do before she dies, and she tried to do all those things one by one, taking each finished task off her wall after accomplishing them. The most difficult things for her to do were to tell the people around her that she was dying. Although she had already accepted it, it was an entirely different thing to make other people accept it. One of the best people in her life was her best friend, who after uncontrollably sobbing upon knowing about her fate, finally just gave in to her request to just spend the rest of her days having fun with her. Maybe most will think it’s like the usual “Bucket List” movies, but I would think it accomplished a lot more than that. In the popular Bucket List movie, the story was about a much older guy who may have accomplished a lot of what he wanted to do with his life already. But in “100”, it was about a woman in the prime of her career, haven’t even gotten the chance to find a partner in life and settle down. On the contrary, she has also lost her father just a few years before, also to cancer, and had a “love of her life” that can never be hers. The movie expressed a lot about tying loose ends, seizing each and every moment, and realizing what is important and essential. In a lot of ways it came close to my heart. There was something so real about each and every thing she was doing, about every little thing that she writes down and decides to do, and about how the people around her were reacting. Perhaps such a dreary movie? Understandably, I never saw this movie distributed commercially. It was something that wasn’t too appealing to the Filipino movie-going public, most of whom would rather watch about cheesy pickup-lines and happy-endings. Let’s admit it, it’s really hard to sell meaningful and really meaty movies and story-lines as a commercial Filipino movie, unless they find a way to have happy endings with the protagonist not dying in the end. However, I always wonder when the Filipino movie-goers would be mature and ready for wonderful movies such as these. Critical movies need not tackle the most horrid, or the poorest, or the most shameful things in life or in the society. Sometimes things as real and as simple as these can make really good movies too. Kudos to the director/writer Chris Martinez, the lead Mylene Dizon, and the entire cast. I know this was released in 2008, but I hope it’s not too late to find and watch the movie, and give a full bow of respect to all of you.